NASA astronomers are using an image of a galaxy named ESO 306-17 to learn more about the formation of star groups, galaxies and celestial events. Since this galaxy is relatively separated from other observable objects, researchers are able to see it more clearly. The ESO 306-17 galaxy is located half a billion light-years from Earth. 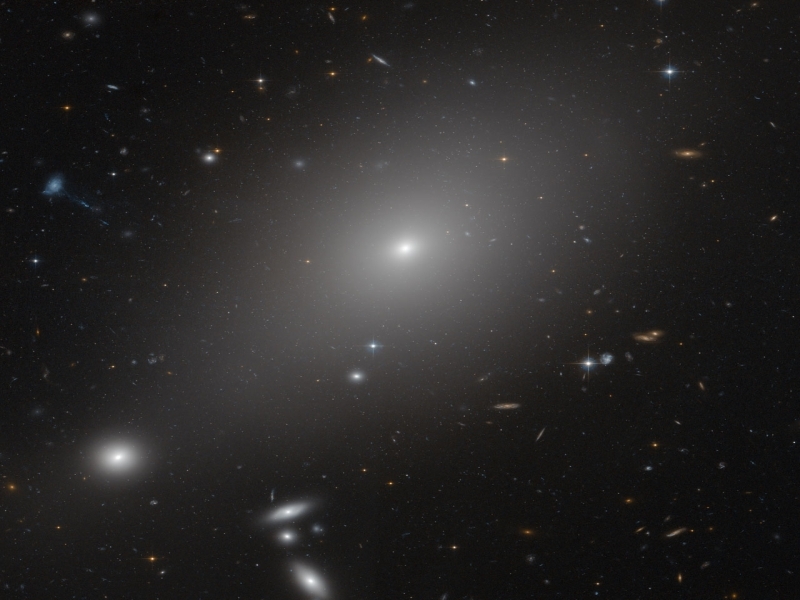 It is a large, bright elliptical galaxy in the southern sky of a type known as a “fossil group”. The reason for this naming is the isolated nature of these galaxies. However, some scientists think that the reason for the galaxy’s seclusion is its tendency to gobble up its next-door neighbors. Currently astronomers believe that gravity brings galaxies together, making them live “as a community.” While this situation can be held for millions of years, gravity finally takes its toll, and the bigger galaxies swallow smaller ones. For instance, there is evidence that our own Milky Way galaxy has meshed with numerous smaller galaxies that strayed too close. In order to know better about this phenomenon, known as “galaxy cannibalism”, the ESO 306-17 galaxy is inspected. When zooming in closely on ESO 306-17, astronomers observed that faint clusters of stars are seen through the bright shine of the galaxy’s large halo. These are globular clusters, tightly bound groups of stars that can often fend off cannibalism from larger, “bully” galaxies. This video demonstrates well the intriguing complexity of such galaxies. Hopefully, studying these surrounding clusters will prove helpful to astronomers in their pursuit to put the pieces of ESO 306-17’s history together. Other usages of this image include searching for nearby ultra-compact dwarf galaxies. Ultra-compact dwarfs are mini versions of dwarf galaxies that have been left with only their core due to interaction with larger, more powerful galaxies. Since most ultra-compact dwarfs discovered to date are located near giant elliptical galaxies in large clusters of galaxies, there’s a chance that similar objects will be found in fossil groups. TFOT has also covered another cosmic fossil – the galaxy NGC 1132, as well as the proposal of a new galaxy formation theory, made by astrophysicists at the Hebrew University of Jerusalem, and the debris spotted from colliding galaxies, which might provide information about starburst activities. For more information about “bully galaxies”, see Hubble’s website.